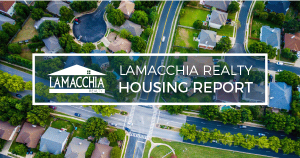 The September Lamacchia Housing Report presents overall home sale data and focuses on the average sale prices for single family homes, condominiums, and multi-family homes in Massachusetts and Southern New Hampshire for September 2016 compared to September 2015. It also looks at other stats like Homes Listed and Pending, as they are often the best indicators for predicting future trends in the market. September was a solid month in Massachusetts, with increases across all categories in both number of sales and average sale price as compared to September 2015. The total number of homes sold across the state in September 2015 was 8,234, and in September 2016 was 8,620 – an increase of just under 5%. The category that saw the greatest growth in number of sales was condos – sales rose a full 11%, from 2,059 in September 2015 to 2,292 in September of 2016. The category with the least growth only sold 7 more homes in the 2015 vs 2016 comparison – the number of multi-families sold in September of last year 745, and increased 0.94% in September 2016 to 752 homes sold. Average price growth was comparatively steady across the three categories, all varying within 2% points from the average, which was a little over 5%. The highest increase in price was in the multi-family category, with prices increasing from $397,769 in September 2015 to $424,521 in September 2016, an increase of just under 7%. Homes listed for sale across Massachusetts fell 4%. 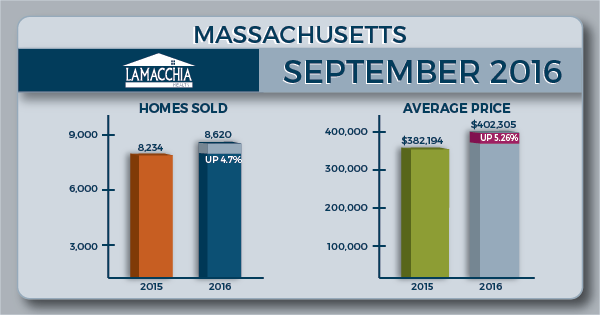 There were 10,582 homes listed for sale in Massachusetts in September 2016 compared to 11,018 in September 2015. There were 8,634 homes that went pending in September 2016 in MLSPIN compared to 8,619 in September 2015, which is a negligible increase of .2%. Unlike Massachusetts sales were down in Southern New Hampshire in September. Overall, sales fell just under 3%, with 1,259 sales in September 2015 dropped to 1,224 in September 2016. Single family homes and condos both fell a bit over 3%, while multi-families single-handedly pulled the average back up, with their sale numbers growing 9%. Average sale prices did increase in Southern New Hampshire – rising from $271,445 in September 2015 to $277,266 in September 2016, a 2% increase. Within the separate categories, however, change in average sales price varied widely. While single families saw an average price bump of 13% (from $266,223 to $301,557) condos saw an average price drop of 17% (from $276,547 to $228,780). September was a good month for the market, with increased sales after a very busy summer with strong activity market wide. We believe that Brexit in late June gave the market an additional push as some buyers wanted to get in on the excessively low rates. It appears that October home sales will be up over last year as well. However, the current market is slower than this summer, and has been for almost a month, as we hit the October slowdown that we have seen the last three falls in a row. This is why it is a great time to buy a home as we explained in last week’s blog, “Don’t Wait Until Spring, 4 Reasons to Buy Now!” We expect activity to pick up in the next week or two and stay busy until Thanksgiving, as it usually does at this time. Anthony explained this in his Urban Update segment with Byron Barnet on 7News.